In Buddhism they have a story for their perception of “precious human birth.” Because being born a human being gives you the ability to do so much for your karma (both good and bad) it is seen as a precious opportunity to help your fellow man and possibly even attain enlightenment. The story goes, imagine there is a turtle adrift at sea that only surfaces every 100 years. Now imagine there is a small ring in this vast sea. It is more likely for the turtle to accidentally poke its head through that ring than to be born a human being. I also incorporated vajras along the outside to signify wisdom and compassion (all important things to learn in this life) and lotus’. The lotus represents your Buddha nature. It rises from the mucky water and blooms pristine, reminding you that no matter what you inner nature, inner good, is always untarnished and that even people you have difficulty with have this good at their core. Treasure the good work you can do with your life! I have a necklace of this mandala that I bought from you a couple months ago, and I really really love it. 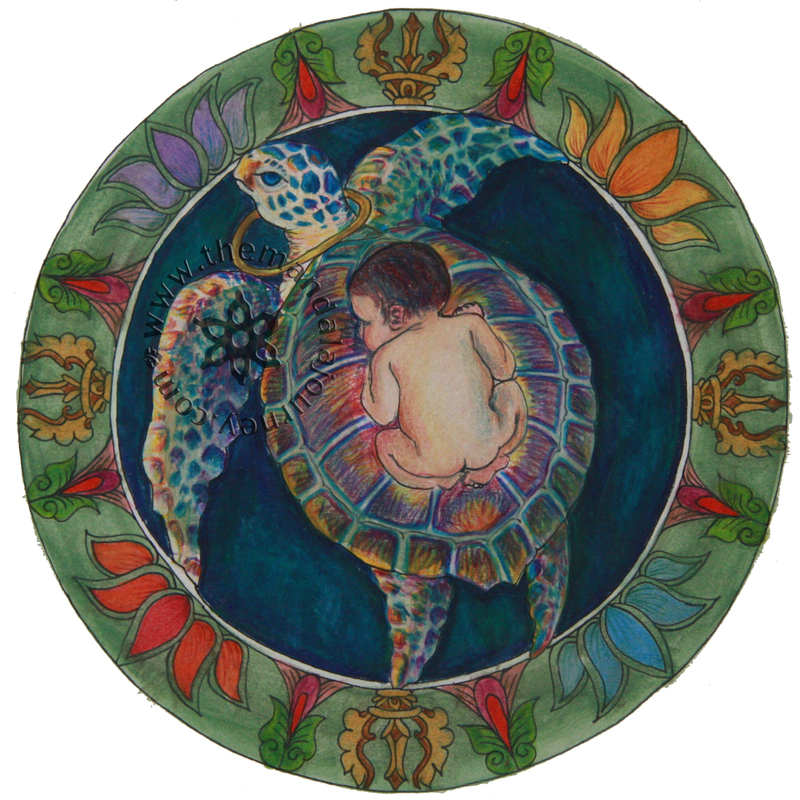 I love turtles, and babies, and the imagery in this piece is just amazing and beautiful. I have been thinking about using it as part of my next tattoo, but I wanted to kind of ask for your permission/blessing to do so first. I hope that you will think of it as an honor and an homage to your art work, but if it makes you uncomfortable please tell me, and I will start my quest for something else to incorporate. Sure, that’s fine with me! Some people have donated some money as a thank you to use the design, like you would pay a tattoo artist to design it for you. If you’d like to do that you can paypal me at amy@birthingbody.org. Up to you! Hi, i’m from Argentina. I’m interested in get the original. Is it possible that you send it to me? Sorry for my english, i hope you understand me. I have this turtle on one of your pendants and I too really really love it!!!! I have worn it to all my recent births as a doula! I am setting up a website and was wondering if I can have the image on it? Do I buy the digital print? Or is there a different process and can I have a link to your website? Sorry I’m a little web illiterate. Anyway thanks so much for your work, you bring me loads of joy and inspiration. How does the print thing works? Do I get a high-quality digital printable version? What does “100 in a series” means? You get a physical print using a 12 color digital printing process as opposed to the 24 color giclee printing process. The limited edition means there are only 100 or 50 printed in the world.